Benefits: the programme will cover international airfare, room and board and all programmatic costs. 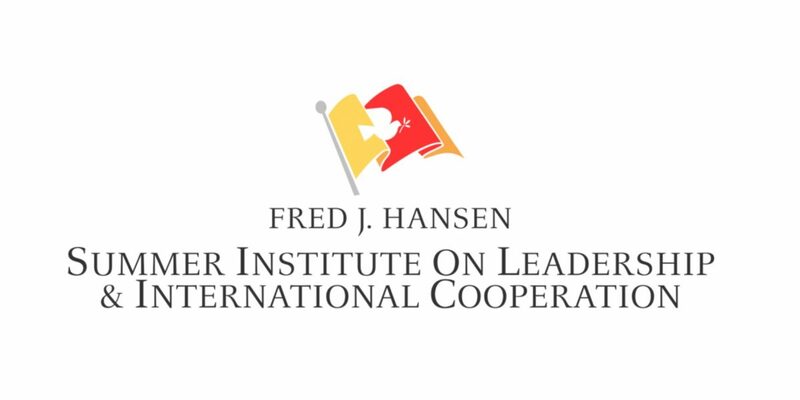 The Hansen Summer Institute on Leadership and International Cooperation is an exciting international program funded by a generous grant from the Fred J. Hansen Foundation. Nine Hansen Summer Institutes took place in San Diego, California between 2007 and 2018. The Institute provides a unique University-based leadership experience and program in international cooperation. For three weeks, young American men and women joined students from a variety of developing countries and regions of social strife. Between then and now, Hansen Alumni have remained in contact via a variety of social networking sites and projects funded by the Hansen Foundation. We are happy to announce the Hansen Summer Institute will host its next group of young leaders in July at the University of San Diego School of Leadership and Education Sciences (SOLES). A primary goal of the program focuses on creating an international community of young scholars who will use their summer experience as a foundation for creating lasting friendships and acquiring common practical understanding of a more peaceful future. Program elements will involve classroom instruction and hands-on training in the latest techniques of conflict resolution, mediation, and inter-cultural management. Classroom training will complement local excursions to San Diego historical attractions and cultural events including a fourth of July parade, SeaWorld, and a harbor cruise. Hansen Summer Institute training aims to provide participants a “leadership toolbox” for resolving conflict and building a better future for their respective countries. ALL APPLICANTS: Successful applicants must demonstrate leadership potential by having worked outside of class in community service, another public service, or in a non-governmental organization. A letter of reference from such a group or organization is required. Upper division undergraduate with 2 years of college/university or graduate student with a professional interest in international relations, diplomacy, international economic development or related fields. Students must be between the ages of 20- 25 on July 1, 2018. Must have demonstrated leadership potential outside of the classroom in the community, nation or region. Have a valid international passport with US visa if necessary by the time the program begins. All Fellows Must Attend The Entire Program. No participants will be allowed to arrive late or leave early. The Hansen Summer Institute is fully funded by the Fred J. Hansen Foundation. This includes international airfare, room and board and all programmatic costs. If selected the only cost to participants will be the fees incurred in obtaining a passport, a U.S. visa and spending money. Before applying read the FAQ’s here. Find more information about the programme and how to apply on the official website.